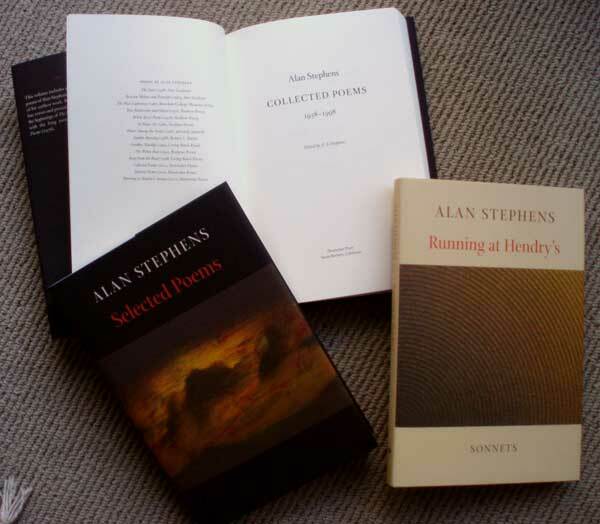 Today, I received the results of 2 years’ work: three volumes of poetry by Alan Stephens, edited by his son, Alan Archer Stephens. There are a few poems by Alan Stephens on the web here, and a beautiful website about the books is here at alanstephenspoems.com. This book project was unusual in that we pursued excellence in a way that publishing ventures rarely do. I centered the poems on the page for nearly 1000 pages of poems. Nobody is crazy enough to do that anymore. There are lots of complicated hierarchies of things — part titles, subtitles, part title epigrams, poem part titles, poem subtitles . . . lots of things to obsess over. And we did. By printing single books at LightningSource (now Ingram), we were able to make adjustments and perfect even more details. Today I held those hardcovers for the first time. The book makes it possible for me to read the writing in a way I couldn’t while it was onscreen, or on single letter-size pages. I found I was reading, enjoying, and then had tucked the jacket flap in as a bookmark so I could read the poem again next time I opened the book. Books really are a wonderful technology. We built these books to last, and I believe they have the qualities that will make them stay in book collections for a long time. VJBScribe designed and composed the books. Dowitcher Press handled printing, fulfillment and marketing. Some information about ordering books is here.